This post is part of my “Broadway in Review” series, where I explore shows on and off Broadway, including national tours and out-of-town engagements. 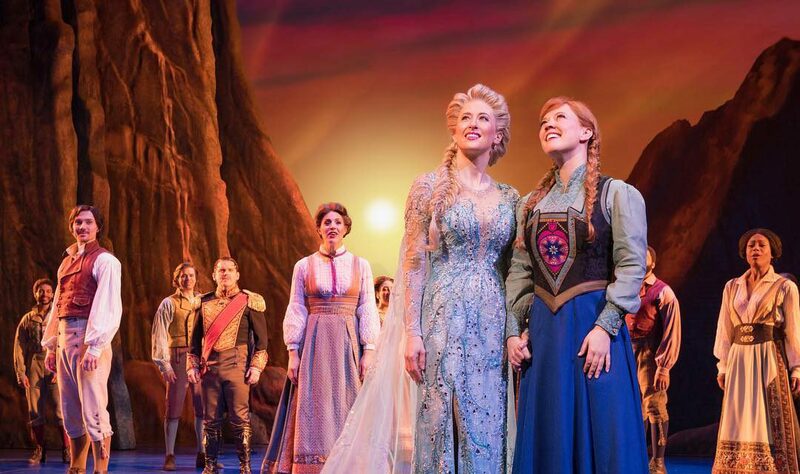 Another of the girl-power musicals currently playing Broadway, Frozen is high on spectacle and low on humor. Like many Disney musicals, it follows the form of the movie it was based on to the letter, without improving on it much. I enjoyed it, but I also almost fell asleep a few times. The many little girls in the audience had a blast. Technically, this is a superb show. It has one of the best sounding houses I’ve ever encountered, with a sound stage that actually rivals the cast album due to the expansive mix and extremely accurate vocal amplification. The stage has many tricks which I won’t spoil for you here. And Disney has used projection mapping—something they are extremely good at in their parks—to great effect here. One or two of the set changes in Frozen earn applause on their own, a rarity in live theatre. So while the performance might be a little lackluster, the story itself a little drab, rest assured you will be delighted by all the effects. In terms of the material itself, Kristen Anderson-Lopez and Robert Lopez have really phoned it in. Their original songs for the movie were clever, if adhering to a certain pop trite-ness. But the new songs take a step back—all cliche and no verve. There’s nothing interesting here, save for the aforementioned Hans number, and that’s a real shame. It’s a giant missed opportunity, and I expected better. Story-wise, the musical flows. But it’s ponderous, feeling much less concise than the obviously much shorter movie, and that extra length doesn’t really buy us anything. Now we get to sit through a bloated 20 minute opening sequence, spending far more time than necessary on the girls’ childhood lives. Now we have a cute but wholly unnecessary song-and-dance bit at the top of Act 2, introducing Oaken (played with a very straight face by Kevin Del Aguila). The ending sequence feels as if the audience is expected to have seen the movie as reference material—otherwise it’s hard to understand what they’re trying to portray on stage. The effects, though. The effects are pretty cool. And the music and the story work, even though they could have been so much better. So if you can stay awake, and if you’re a fan of the source material, you’ll walk out of the theatre happy with your experience. Frozen is playing at the St. James Theatre. Broadway in review: Hello, Dolly! RMAU on Backshadowing—it’s foreshadowing, but backwards!